Our office works cooperatively with some of the best OPHTHALMOLOGISTS in the NORTHWEST. We are also happy to work with yours as the need arises. 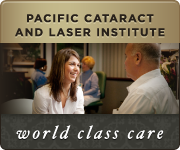 In the absence of an established patient relationship with an Ophthalmologist, we recommend our patients have their CATARACT CARE by PACIFIC CATARACT and LASER INSTITUTE (www.PCLI.com ).